@natedog: Yea, but at least when its over, you can start snorting CS gas like it was Afrin. only time ever did gas masks was in boot. after that it was frigging OBAs and fire fire fire at least 3 days a week. Navy. Every man a firefighter. @Snarky Parker: thats gotta be cold there. Clearly this must be a military thing you guys are talking about because to me NBC is a tv company, TDY is for deaf people to read people talking on the phone, and AB is a blood type. @journeyman: What’s MOPP? Military people and their crazy use of abbreviations. Yeesh. 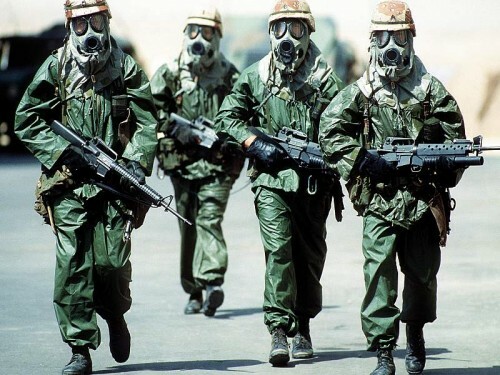 @Puulaahi: Mission Oriented Protective Posture; MOPP is a term used for equipment put on during chemical attacks. There are 5 levels of MOPP, MOPP 0 through MOPP 4. MOPP 4 consists of having all gear on including chemical gloves, boots, gas mask and trousers and shirt. @Puulaahi: Where do you think STFU, FUBAR, WTF, DILIGAF, and GTFO originated? Those were in use in the Fleet long before I got there in 88.